A hilarious scripted talent show filled with fun characters! The trial of the century is happening in Wonderland! the British Inquiry, and survivor accounts. A short play about a tech rehearsal that puts new meaning into the phrase “hell week”! An absurdest comedy in one-act! A fascinating stage play that explores the inner lives, struggles, and triumphs of people with schizophrenia and their family members. Scroll down to see the synopses. at Heuer Publishing or Amazon, please contact Michael Wehrli. CINDY & ELLA’S TOTALLY AWESOME ADVENTURE - “Heyyyy, I’m getting some slammin’ vibes from you people. Groovy!” This play is a Cinderella story like you’ve never seen it! A funny, irreverent take on the classic tale done in the comedic melodrama style – complete with audience participation! This play has everything: Cindy and Ella, two hip chicks from the 1970s; two cool hip hop artists called the Princes of Rap; a raging Stepmother and two grody Stepsisters; three wacky Fairy Godmothers; a talking Cow; time travel; a person turned into a fly; a verbose Scientist; two Barbarians; and much more! A play that is just as much fun to put on as it is to watch. Tons of audience participation and hilarious comedy situations. This play takes a hilarious and outrageous turn on the classic Snow White story, all within the wacky style of comedic melodrama. The play is heavy on the jokes and full of zany characters: a Prince that speaks in spoonerisms; a wise-cracking mirror; comical dwarves that include Whiney, Hyper, Corny and Slowpoke; two clueless Huntsman; and much more. Audience participation too! HAPPY DAYS IN OZ - Follow Dorothy Ann, a lovely 1950’s girl whose life turns upside down when she is magically transported to the land of Oz (pronounced “Oh-z”). On her way to meet the insane Wizard, she makes friends with a talking Jukebox, Blue Suede Shoes, and Pink Cadillac! Unfortunately, she also makes enemies of the evil Lunch Lady and Janitor. A wacky comedy! A CHRISTMAS CAROL- A faithful adaptation of the Charles Dickens classic novel with the genders switched. Elizabeth Scrooge is taken to task by Julia Marley and the three spirits. THE CHILDREN'S CHRISTMAS CAROL - Adapted from the short story Johanna Spyri (who wrote “Heidi”), this charming tale takes place in the mid 1800s. A poor family living on the outskirts of Altdorf, Switzerland struggle to keep their spirits up as challenges come their way. An uplifting tale of love and the power of community. NEVER TRUST A PENGUIN - Thinking they are late for school Suzanne and Peter come bursting into the classroom only to find…no one there. After several tense minutes alone, they have a series of strange and hilarious encounters with many bizarre characters including: a surfer-dude Janitor; a malapropism tossing Principal, an insane Health Inspector & Robot; Sappy the Safety Clown; two fanatical Firemen; a mysterious Penguin; and many more strange and hilarious characters. It’s an Alice in Wonderland-like journey for Suzanne and Peter and a day they will never forget! Available at Amazon.com! LAW & DISORDER - The play is a bizarre and hilarious comedy mash-up of Alice In Wonderland, Snow White, The Three Little Pigs, Little Red Riding Hood, and a trial drama. In the odd realm of Wonderland, the Cheshire Cat is the judge for the trial of the century. It’s such a big trial that there are actually two cases going on at the same time! Poor Granny (grandmother to Red Riding Hood) is accused of stealing the Queen of Hearts tarts. Case #2 involves the tough Mr. B. B. Wolf who allegedly blew down two Pigs’ houses and threated to eat them. There are a wide assortment of crazy characters. There’s the Mad Hatter, who steps in to be the Court Bailiff and has a grand time spinning people around and giving crazy ways to swear them in. On the opposite end is the stern diva, the Queen of Hearts who wants nothing more than to have someone’s head lopped off. B. B. Wolf’s brother is also on there to help out. He has hired two of the Seven Dwarfs to be the Defense Lawyers – Dopey and Bashful. He also brought a big-word using and strange Scientist to offer expert testimony. The 2 Pigs (there brick house brother couldn’t make it) are also well represented by Alice and Red Riding Hood. The play is a fast-paced comedy farce with tons of hilarious characters and situations. AESOP'S FABLES - An adaptation of four Aesop’s tales for young actors. The stories include: “The Boy Who Cried Wolf”, “The Mice In Council”, “The Miller and his Son”, and “The Sick Lion”. HAMLET: TIME OUT OF JOINT - This fascinating adaptation from the Shakespeare play is fast paced and focuses on Hamlet’s inner thoughts and his ethical struggles. 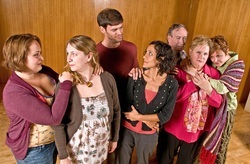 The play is told in the style of an acting troupe in rehearsal on a mostly bare stage. All the props and costumes are on stage the entire show and most of the actors play multiple roles. Interesting lighting and sound effects throughout. A Hamlet that will leave your audiences breathless. DRACULA - A faithful adaptation of the classic gothic horror story by Bram Stoker. A unique adaptation of Shakespeare’s play set four hundred years in the future and with the genders reversed! A troupe of female aliens come upon a backward planet called Earth and find a drunken lout who treats woman terribly. They take him on a sweeping journey in their Holographic Prison and deposit him on a world where men are subservient to the women. Most of Shakespeare’s original text is kept in tact but with an interesting science fiction twist. 20 MINUTES IN PURGATORY – A play about second chances and dealing with the consequences of your actions. Judas, a woman in overalls and who plays a guitar, has been regulated to oversee purgatory. She is visited by the recently departed and it’s her job to pull their difficult stories from them so she can determine their next journey. A play about regrets, absolution, and possible redemption. Moving and poignant. A crazy backstage comedy. The playwright is at the end of his rope as they are mere days away from opening and all hell is breaking loose at the dress rehearsal. Arguing actors, a director who is always on the phone, a disgruntled stage manager, and no costumes or props. But “don’t worry” the director keeps saying, “It’ll all work out…” Available at Heuer Publishing.